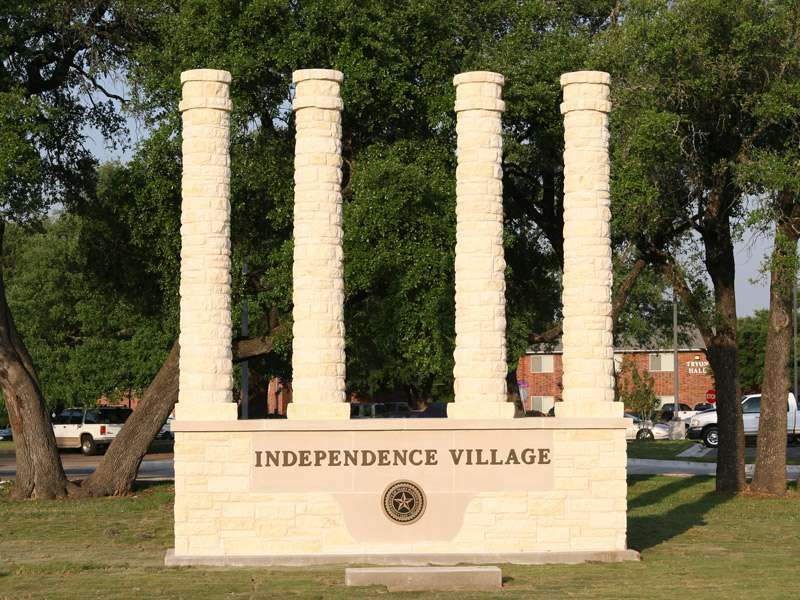 Known for years as Tryon, this complex of apartment-style buildings was renamed Independence Village in 2006 in honor of the birthplace of the university, Independence, Texas. Located on the northwest end of the campus, the residential buildings and the commons building are each named in honor of individuals who were significant to the university. Clark, Provence, and Ferguson Halls were built in 1996, and Taylor, Grover, James, and Tryon Halls were added in 1998. The seven two-story buildings have a total of 54 units that are two bedroom and two bathroom and are assigned with four residents. Shannon Commons Buildings sits in the middle of the complex and services all of the Independence Village residents. The building houses thecomplex office and a large common room with a TV area, surround sound, pool table, kitchen, and seating area. Residents use this space for programs and events, or to just hang out or play pool. There is also a study room, a large computer lab, vending machines and a mail area for students to send and receive mail. Resident Assistants are assigned throughout the complex and there are three Resident Directors living on-site. Campus Police patrol this area during the day and evening hours. The bedrooms are 12' x 12' (144 sq. ft.). The common living area, including the dining space and kitchen is approximately 400 sq. ft. The dining area is furnished with a dining room table and four chairs. The living area is unfurnished. The kitchen has a set of cabinets, a sink, a full-size refrigerator with ice maker, dishwasher, disposal, and stove. Each double occupancy room comes equipped with two twin beds with standard 75" mattresses, two chest of drawers, and a 5' x 8' shared, walk-in closet. The beds can be raised for lofting. Each unit has a bathroom for each roommate pair (two bathrooms). Wireless internet is available and there are two internet jacks per bedroom and three in the living area. There are cable connections in each bedroom and in the living room. Cable and internet service are provided. View UMHB Channel Guide. Window sizes in the unit vary in the two bedrooms and the living area. See the floor plan for window sizes. Mini-blinds are provided. Floors are carpeted in the living area and bedrooms. The dining and kitchen areas have hardwood laminate type flooring and there is tile in hallway and bathrooms.